Seven months ahead of Oktoberfest, LSG Sky Chefs and Lufthansa took the collaborative process of menu development to another next level. They invited members of the Lufthansa cabin crew to design the first menu of the Oktoberfest menu-cycle, which will be flying in Lufthansa Business Class in September and October. It is standard procedure that for the creation of airline menus, LSG Sky Chefs’ menu designers work closely with the product management of airlines. The product management typically contributes insights from market research and of course, makes sure that the airline’s product, which they know inside out, is consistent and in line with the company strategy. But there is another group of people who not only know the product, but also the demands of passengers inside out: The flight attendants of an airline. For the Lufthansa Oktoberfest menus in 2018, they came together to design a top-notch menu to suit passengers’ tastes. Mid-February, 9am, briefing time. On that particular day, the eight pursers and flight attendants did not meet in the usual briefing room in the Flight Operation Center, but at the LSG Sky Chefs catering facility in Munich. This briefing was about the inflight service. Today, however, it is not from the crews’, but from the catering perspective. 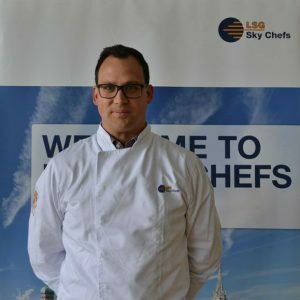 “It’s only February, and yet we’re already thinking about autumn,” Christopher Schölderle, LSG Sky Chefs’ Lead Chef for Lufthansa, opened the workshop. Under the motto “Oktoberfest”, a working group of menu designers from LSG Sky Chefs, Lufthansa product management and, on this special occasion, flying personnel had come together to co-create the menu cycle for the first Business Class meal in September and October. Before starting with the actual menu creation, the menu designers of LSG Sky Chefs explain what makes a good airline meal. Most importantly, our taste-buds perceive food differently at an altitude of 10,000 meters. The food simply tastes different in the air than it does in a restaurant on the ground. 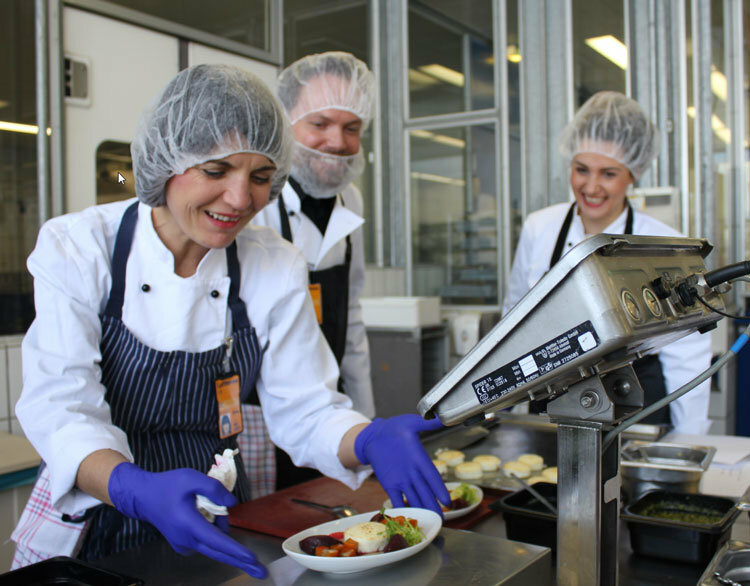 Precision is key in LSG Sky Chefs’ operations, so each plate needs to be weighed by workshop participants Anita Rajcic, Thomas Spanfelner and Sandra Rosenkranz (from left). As the first step in this unique co-creation project, each of the participants presented their own suggestions for the Oktoberfest menu. For the second step, the menu ideas were tested in the kitchen. Three interdisciplinary teams prepared the appetizer, main course, and dessert before arranging them tastefully for serving. Everything on the menu – from fish, meat and vegetarian menus to Bavarian crème, the typical “Wiesnherz” (gingerbread heart with sugar-writing) and roasted almonds – had to fit the motto Oktoberfest, or “Wiesn”, as the Bavarians say. “From our experience on board, we can tell what is well or not so well received by passengers,” says Sandra Rosenkranz, who is a purser on short and long-haul flights (A320/A340). She is convinced that char and trout are a definite part of a successful Oktoberfest menu. Her idea to include the component fish was eventually realized in a well-balanced dish: Trout with Chioggia beets, radish, and horseradish. Dinner is served! 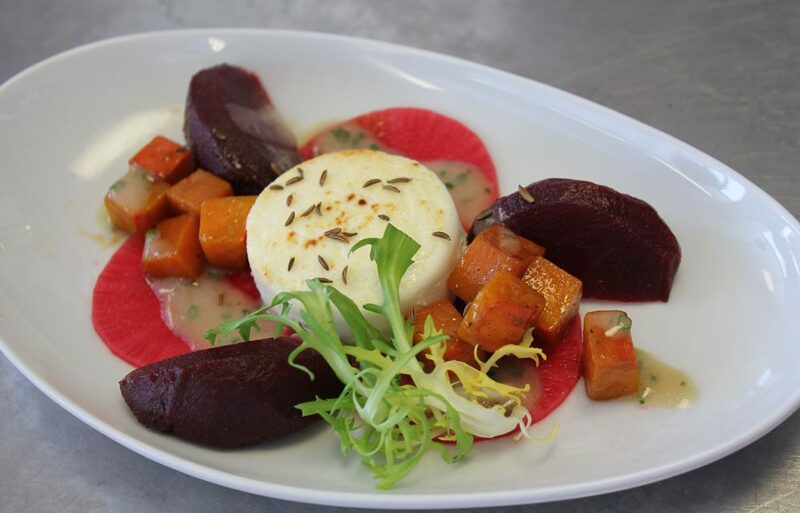 One of the proposed Oktoberfest menus: Goats cheese with beetroot wheel, roasted pumpkin and a touch of caraway oil.